.The area has direct access to several bays where swimming is allowed (pebble beaches lying diagonally and chairs to rest, 300 meters away). Access is done by a small public road, open to everyone, where hikers, campers, occasional swimmers are regular. It is accessible via a gate near the playground. Facilities at the complex are a reception area, a heated outdoor swimming pool with paddling pool, open from mid-June to mid-September depending on the weather, sports fields and play area for children. This chalet can host up to 4 persons. It consists of a living room furnished with sofa beds; a bedroom furnished with a double bed and a second bedroom furnished with one single bed; a kitchenette equipped with a refrigerator, electric hotplates and microwave; a bathroom with a shower, sink and toilet; and a terrace with garden furniture. Please note that the pictures regarding the interior of the accommodation are given with indicative title only. You must pay a deposit of 300 euros and tourist tax on arrival. The deposit will be returned to you after the inventory on the day of departure or by post. 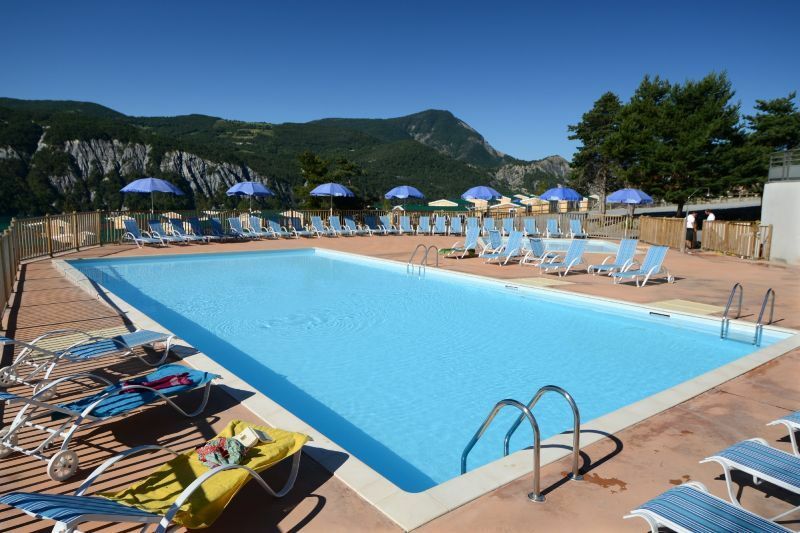 Included in the price: heated outdoor pool with paddling pool open from mid-June to mid-September depending on the weather and sports fields. Not included in the price: Bed linen is not provided; the rental price is 11 euros per person; cot costs 25 euros per stay; pets are allowed for 50 euros per stay; final cleaning from 56 euros on request. - A restaurant / bar / a small supermarket. Please note that any additional services that are payable locally may be changed without prior notice. All information provided is intended to be informative and general. We are not liable if such changes occur unexpectedly. The resort offers many holiday activities in this beautiful area: canyoning, hiking, paragliding and hang gliding. You can go mountain biking on the Transubayets route, tunnels on the old railway line that lead you to the banks of Lake Serre Poncon, there is lighting. Places worth a visit: Mercantour national park, the prehistoric dolmen of Villard, the St. Lawrence church built in 1715-1730, museum of the Lauzet valley. The Roman bridge to the narrow passage of 40 meters above the Ubaye is a classified landmark from the 13th century. The first week of August there is fireworks in Lauzet Ubaye.